Depending on where I am, a good part of my day is spent telling people where the bathrooms are. Again, depending on the location, I also tell them where they can find the post office (next door to where I am standing). I help elderly ladies to their cars, direct visitors to local restaurants (not my strong suit), and regularly provide a table where passersby can rest their purchases while they borrow my pen so they can fill out the addresses on the postcards they intend to mail at the post office which I then direct them to. Oh, yes. And once in a while I sell a book . The Sanibel Sunset Detective novels I write are set in and around Sanibel and Captiva, two barrier islands off the west coast of Florida hugely popular with visitors, particularly visitors from the American Midwest (I am certain Minnesota empties out in February). Every year, once I have finished a new novel, I hit the road to promote it. Now in a bygone era, authors were escorted from town to town by attentive publicists to sit in hotel rooms entertaining the local press, appear on local TV and radio, and perhaps visit a bookstore or two to meet readers before moving on. As a teenager I read accounts of the rigors of book tours described by famous authors like Pierre Berton and Margaret Atwood. As a young reporter I visited many hotel suites containing authors such as Irving Stone, Irving Wallace, Harold Robbins, Leon Uris, and Stephen King to name a few, everyone seated on a sofa sipping morning coffee and perhaps nibbling a sticky bun, at peace with the world, safe in the knowledge that they did not have to direct anyone to the bathroom. Not to say that sort of traditional book tour doesn’t still happen, but most working authors—and I am certainly one of those—have to get out there, book in hand, plastering on a hopeful grin, ready to give ’em a little razzle dazzle in venues ranging from independent bookstores and farmer’s markets to airports and supermarkets, to—well, you name it and I’ll probably show up. On the one hand, this is roll-up-your-sleeves, working-in-the-salt-mines bookselling. Conversely, it is also the best way in the world to meet readers, new and old. 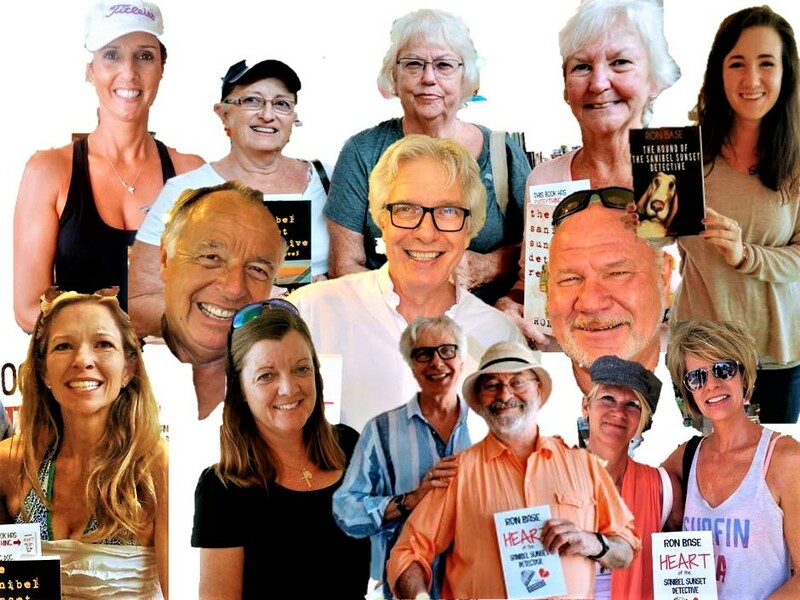 I have met hundreds if not thousands of people over the past three months at sixty-seven different book events. Tim Sample the well-known humorist and TV personality (he used to do Postcards From Maine on CBS News Sunday Morning) actually bought a book..
Randy Wayne White, the bestselling literary icon around these parts, so famous that three local restaurants bear the name of his fictional hero, Doc Ford, stopped by to say he’d heard great things about the Sanibel Sunset Detective. He sounded pretty convincing. Why Mike Pence, the vice president of the United States, even waved at me on his way to get a haircut next door to MacIntosh Books on Sanibel Island where I was doing a book signing. Alas, the veep didn’t buy a book. Maybe just as well. I’m always amazed at the interesting people I meet. An assistant attorney general from Pennsylvania on Sanibel with her girlfriend who runs a trucking company; a French diplomat, recently posted to Washington; a brave mother on one last vacation with her daughter dying of brain cancer; a psychiatrist excited because she’d just finished writing a dissertation on Norma Bates of TV’s The Bates Motel; Warren who claimed to be the only Bedouin in Fort Myers, Florida, born in Saudi Arabia (his father was in the oil business), who ended up a devout Jehovah’s Witness. Dorothy Jore reminded me of one of my favorite reader stories when we met again at Annette’s Book Nook on Fort Myers Beach. She and her husband, Jerry Dahlberg, were Chicago police officers on patrol together. She thought he was a good partner but no more than that until one day they confronted a wanted gun runner. The guy was driving a car filled with guns. When they trapped him in an alley, he opened fire. Jerry leapt in front of Dorothy, taking the bullet intended for her, and then, despite being badly wounded, returning fire, killing the gun runner. Dorothy stayed by Jerry’s side while he recovered in hospital. Sitting there with him hour after hour, she began to think that anyone who would risk his life for her might make a pretty good husband. Twenty-seven years later, they are still married. None of these fascinating reader interactions would be possible sitting in a TV studio or a hotel room. Still, I’m always of two minds about the hard business of flogging books. There are moments when I do wonder what I am doing with my life. Here I am in my late sixties lugging around a folding table, yanking books out of the trunk of my car, on my (increasingly sore) feet for hours (sitting doesn’t work for me) noting the truth of Leonard Cohen’s admonition about aching in the places where one used to play, trying not to look a fool when hour after hour no one pays the least bit of attention. At these times, any ego boost that enthusiastic readers might have provided evaporates. I am constantly made humble by the passing multitudes who don’t seem the least bit interested in Sanibel Sunset Detective novels or their author. Demons begin to crawl across the landscape of my memory, reminding me of all my shortcomings, my many failings in life, the finiteness of the time I have left on this earth, and the futility of what I am doing with that time. Straight down to the back and then right through the double doors, answers the author, keeping his smile rigidly in place. I live in fort Myers and vacation on Sanibel Island. I have read all of Ron’s books, and enjoyed all except the last one. Ah, book tours. I too have experienced the good, bad and really, really ugly. Like sitting in a bookstore in Langley B.C. one evening with a stack of books in front of me hoping one or two people might not be watching the seventh game of the Stanley Cup finals with Vancouver being one of the teams. Guess how many showed up — yup, zero. Or being in Seattle to promote a novel on a sunny, warm Saturday afternoon which happened to be the first time in over a month with no rain. Guess how many showed up — yup, zero. But you, my friend, have that killer smile and are indefatigable. Keep on selling!